Last week, Yahoo announced that it would pursue a spinoff of its core Internet business, while leaving its Alibaba stock in the old company. Yahoo in recent years has made a push to expand its footprint in the mobile advertising space, in an effort to compete with Google’s monetization platform. The company has also made a number of strategic acquisitions in the mobile and multimedia space. Envision IP analyzed Yahoo’s US patenting activity to understand the company’s IP strategy. While Yahoo has been actively receiving new patents over the last five years, its has drastically slowed its filing of new patent application. In addition, the company has been divesting patents in certain technology areas that are unrelated to its online search monetization/advertising focus. These technologies include social networking, streaming media, and e-commerce & mobile payments. 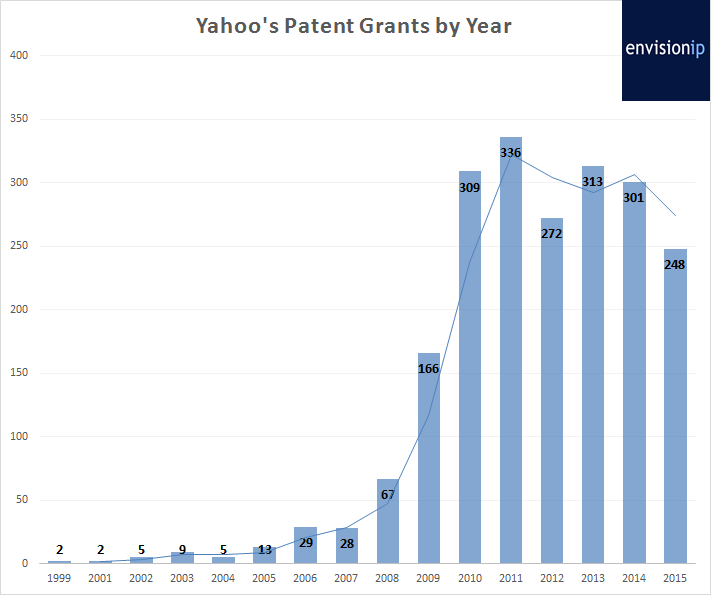 Yahoo currently owns 1,986 US patents, and it has been steadily receiving new patents since the early 2000s. Patent issuances peaked in 2011, with 336, and have remained relatively stable with an average of 280 issuances per year since 2011. To date in 2015, Yahoo received 248 new US patents. Yahoo may not be able to maintain its rate of patent issuances going forward however due to a drop in patent application filings in recent years. The company’s applications peaked in 2007, with 399 applications filed. Since then there has been a dramatic decline in patent filings, with only 66 in 2013. As patent applications typically publish 18 months after their earliest effective filing date, we cannot determine if there has been an uptick in filings for 2014 and 2015 as of yet. 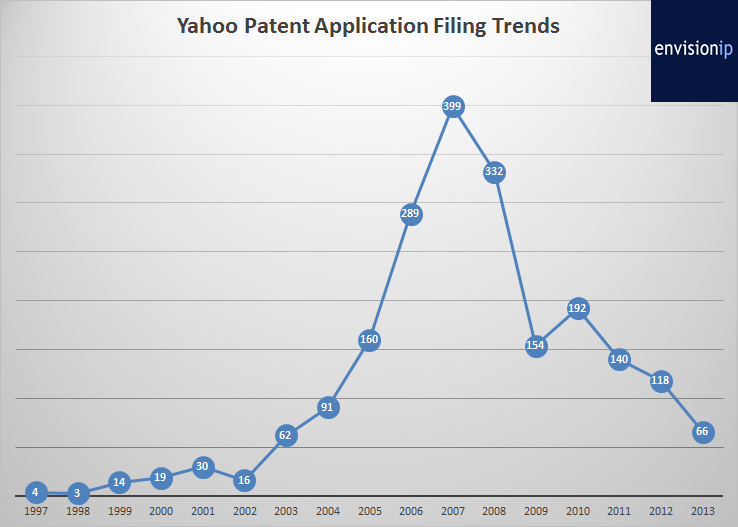 The patents granted to Yahoo in recent years are likely a product of patent applications filed during the peak years of 2006-2008. As a result of decreased year-over-year filings since 2010, Yahoo may receive fewer and fewer new patents in the coming years. 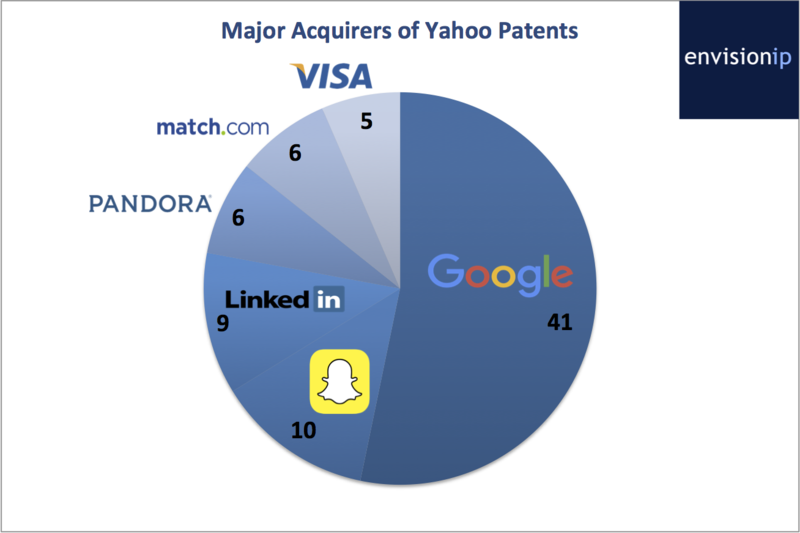 Taking a looking at patent assignments, Google is the largest acquirer of Yahoo patents. Yahoo transferred 41 patents to Google in 2014. These patents cover a wide range of technologies, including database and cache management (US 5797008 & US 6128623), cloud technologies (US 7921132 & US 7860865), and social search & user location-sensing (US 8484191 & US 8045695). The second largest acquirer of Yahoo patents is Energetic Power Investment Limited, with 26 patents. These patents relate to e-commerce, messaging, and domain traffic analysis technologies. Snapchat acquired 10 patents from Yahoo this past October. These patents primarily relate to instant messaging and screen sharing technologies. (See for example US 7133900, entitled “Sharing and implementing instant messaging environments”, and US 8554868 entitled “Simultaneous sharing communication interface”). We noted in a report last year that Alibaba acquired patents from Yahoo for $70 million, however those transfers have not yet appeared on the US patent assignment database. Yahoo has not been very aggressive in offensively suing third-parties for patent infringement. One notable exception was in 2012 where Yahoo asserted 10 patents against Facebook. The parties ultimately settled the dispute with an internet advertising and licensing partnership. Given its relatively passive activity with enforcing its patent portfolio, we suspect that Yahoo will likely forego litigation as a means for monetizing unused patent assets. The company may expand its licensing activities however, in addition to possible continued sales of patents unrelated to its core Internet and mobile businesses.